Nowadays the business unit is the state of art coordinated by side systems such as Logistics Systems. Especially when it has been innovated with IT systems , the Logistics can control more extended scope in terms of optimizing and visibility. As time goes by, this kind of innovation has been accumulated in specialized Logistic Company which provide outsourced Logistic services. So the competitive of outsourcing company is depending on how well to facilitate this benefit from the service providers. The success factors are low cost and consistent high service level which is not depending on one specific service provider. 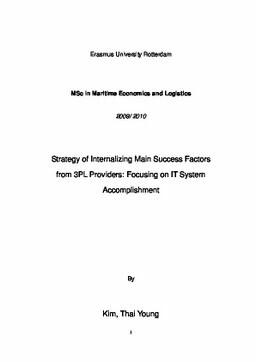 So this thesis intends to find out the strategy for utilizing outsourcing service in Logistics. The thing is that there is an applicable case study with this regards. This case thought that main factor which could get the success factors above through would be the Internalizing of IT systems and highly skilled human resources which usually have been belong to the Logistic service providers. This case actually implemented this internalization in 3 years (2008~2010). So We have verified whether this internalization worked or not by investigating the visible example cases and related indexes as well as concept of related peoples like project member , direct /indirect customer, supporters of business. Finally the result gave us the strategic views that this approach must have been right one in virtue of several proofs and results of surveys. Additionally there are considerations that applicant should not forget from the project experiences. I hope this strategic view will help followers in the applicable industry as well as academic results.